This arthroscopic procedure is performed to repair a tear of the biceps tendon at the point where it connects to the labrum, a ring of cartilage that surrounds the shoulder socket. A tear at this point is called a SLAP (Superior Labrum Anterior-Posterior) tear. SLAP repair is performed under general and regional anesthesia, and patients usually leave the hospital the same day. This condition is a tear of the labrum in the shoulder joint. The labrum is a ring of cartilage around the shoulder socket that stabilizes the head of the humerus. A SLAP tear occurs at the point where the biceps tendon attaches to the labrum at the top of the socket. A SLAP tear actually is an acronym that stands for “Superior Labrum Anterior and Posterior.” This condition was first named in 1990. SLAP tears can result from injury, including: a fall on an outstretched hand, a shoulder dislocation, a sudden jerking of the arm, throwing, or a motor vehicle accident where the shoulder rolls around the seatbelt. SLAP tears can also occur with repetitive overhead activity. SLAP tears are associated with the normal aging process in people over 40. Symptoms may appear suddenly or over time. Symptoms may include pain in the front of the shoulder, popping and clicking, and reduced function. Speed and strength with throwing, serving, swimming, or lifting may be diminished. An MRI can help with the diagnosis of a SLAP tear, as can the physical exam. Treatment initially consists of rest, anti-inflammatory medication, stretching (especially shoulder internal rotation), and strengthening. 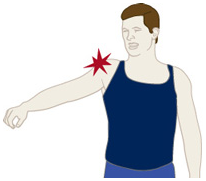 One of the methods of surgical treatment of a SLAP lesion involves the arthroscopic reattachment of the biceps back to where it belongs at the top of the socket, especially in those patients 40 and under. This procedure is performed in an outpatient surgery center. The patient usually goes home the same day. A sling is utilized postoperatively for about three weeks. Physical therapy plays an important role in the recovery process.